On these pages you will find some of my holiday pictures. Click on one of the red dots on the world map below to select a destination. Click here for the next page of pictures. When I have some time, I will add more of the places I have been to. Each of these pages contain lots of images, so they may take a while to load completely. In August of 1998, I was on a business trip to Japan. I took some days off to travel around the country on the Shinkansen trains, which are a very efficient and quick means of getting around. First, I went to Fuji-san and climbed the mountain from the 5th station (which is approximately halfway) to the top. After I recovered, I continued my journey to Kyoto and the famous garden of Kanazawa. On the island of Kyushu, to the west of the main island Honshu, I visited Kumamoto castle, and Mount Aso, which has an awesome green crater lake (Nakadake Crater). I met some friendly folks there who suggested I try the local specialty, which I did ... it was sashimi of horse meat! 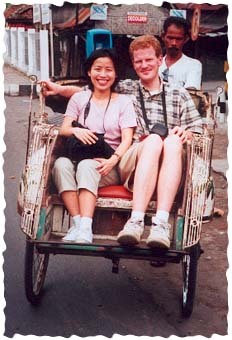 In January 2000, my fiancée went back to her beautiful home country of Indonesia for a month. I came over for two weeks to visit her and I received a warm reception by her parents, brothers and sisters. She prepared me in advance to expect a very different world, which it certainly was. First of all, it is an absolute paradise for food lovers. We enjoyed delicious Nasi Goreng, Rendang and Sate ayam almost every day. With all these dishes, I ate lots of very spicy sambal (the kind that makes you scratch your head until you're bald). The first week of my visit, we were in Jakarta, which is incredibly hectic and crowded and certainly not the most scenic city I have ever been to. 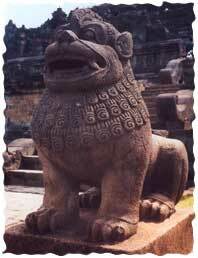 On the plus side however, it is a real haven for high-tech lovers, where you can buy every imaginable PC software package, often well before its official	release date in the U.S.
We made a wonderful day-trip to Yogyakarta to see the ancient and awe-inspiring Borobudur. We had a fantastic guide, who spoke Dutch and managed to squeeze lots of activities in one day. After the Borobudur, we went to see Prambanan (a Hindu temple), the Yogya Sultan's palace, a batik workshop and a wayang (shadow puppet) performance. Some of the local tourists apparently thought I was quite sight in my own right. They kept on asking me to take a picture with them, giving me a rare taste of what it might be like to be a celebrity! 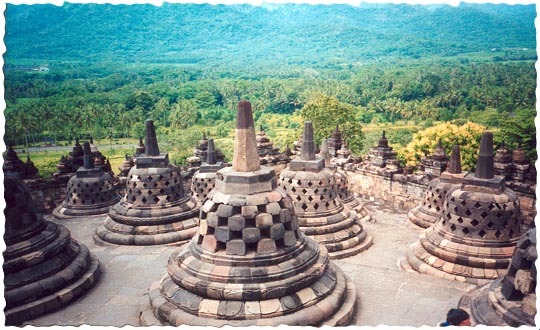 Borobudur is the largest Buddhist shrine, built around 800 AD. 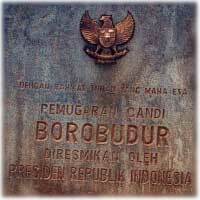 Its ruins were uncovered by Stamford Raffles in 1814, and eventually Borobudur was restored to its current state with the help of UNESCO funds. 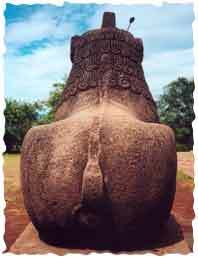 An open stupa, exposing the meditating Buddha. There are 72 of these stupas, each with a Buddha inside it. On the lookout, just outside Borobudur. Doesn't he have great buns? The buffels do the hard work -- but don't even think about taking their picture without giving 500 Rupiahs to the guy behind them! The second of Indonesia's 13,600 islands we saw was Bali, where we spent a couple of days, relaxing at the beach, being pampered in our hotel and taking in some of the famous sights. Would you mind a coconut to welcome you to your room, and freshly squeezed papaya and mango juice with breakfast? 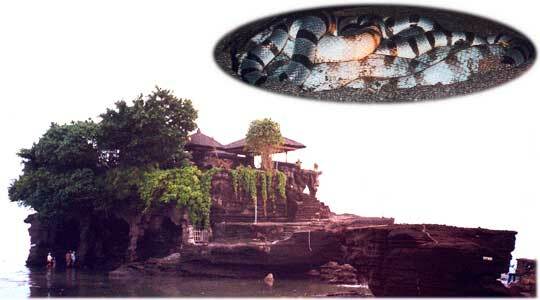 This holy snake awaits you in a small cave near Tanah Lot. Tanah Lot, a stunning temple situated on a rock in the ocean.